Did you know that bananas are considered one of the healthiest foods in the world? That is, according to the World Food Federation, who describes the fruit as “wonderfully sweet with firm and creamy flesh, bananas come prepackaged in their own yellow jackets and are available for harvest throughout the year.” Did you know that the Philippines is one of the world’s leading exporters of bananas? 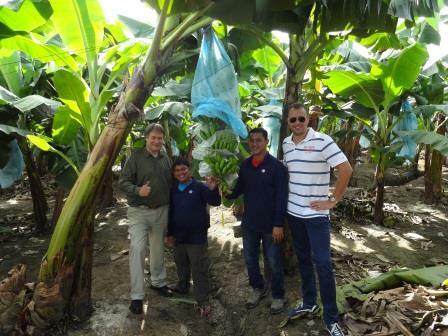 Did you know that the banana industry is facing severe problems: crop diseases, increasing pressure to keep prices down while improving quality, and poor cooperation among industry partners? I didn’t either, at least not before my first visit in 2012 to Nader & Ebrahim S/O Hassan Philippines, or NEH, based in Davao in the southern Philippines. 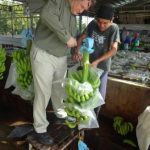 This banana exporter wanted to use the HPO Framework for spearheading organizational improvement, and to clarify an ambitious corporate strategy to drive improvements in production and quality, and all this without increasing the cost for clients. 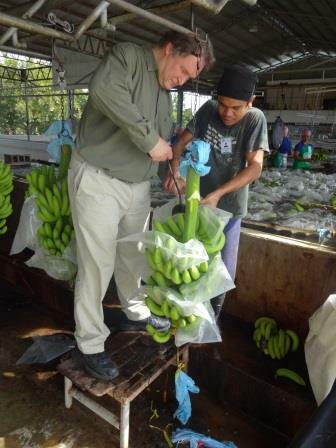 While spending two weeks at NEH, together with my colleague Esther Mollema, in which an HPO Diagnosis was performed and several HPO workshops were conducted, I learned a lot about the fascinating banana industry. From that moment on, peeling a banana would never be the same for me again! 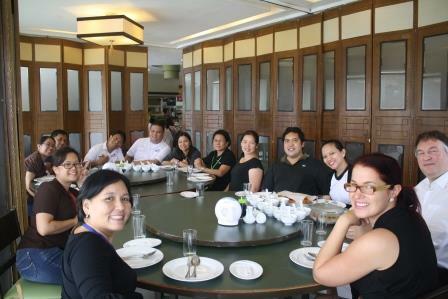 A year later I returned to Davao, this time to conduct a high performance partnership (HPP) diagnosis. When an organization is in the process of transforming into an HPO, sooner or later the time will come when the quality of the value chain in which the organization operates becomes important. After all, if suppliers and buyers aren’t HPOs, the overall quality of the organization will be fully or partly offset by the poorer quality of the other partners in the chain. As a result, the end buyers (consumers) will not be optimally served. That’s why it’s important that not only the organization, but also its value chain operates integrally at a higher level, and that individual organizations in the chains become HPOs as well as the links between these organizations. In other words, creating an HPP is essential. 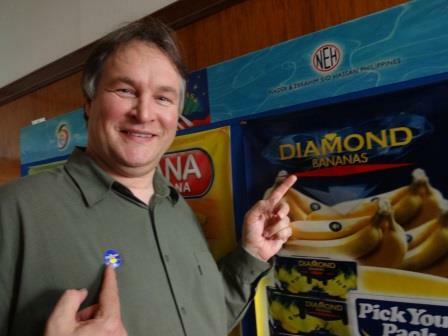 At an early stage NEH realized that it had to involve its partners in its HPO transition, and therefore the company invited a selection of growers (who provide the bananas), suppliers (who provide packaging material) and customers (who buy the bananas) to participate in an HPP diagnosis. So in Spring 2013, quantitative data were collected from growers, suppliers and customers through the HPP Questionnaire . In this questionnaire the respondents scored NEH on how well it did on the various characteristics of a high performance partnership, and they also indicated how successful they thought their partnership with NEH was. 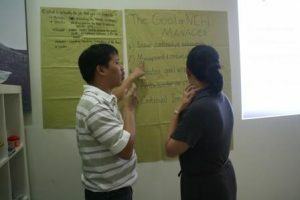 In turn, NEH filled in the same questionnaire, rating its partners and indicating for each partner how well it did on the HPP characteristics and how successful the particular partnership was with this partner. The collected data were sent over to the HPO Center and, together with my colleague prof. Robert Goedegebuure of Maastricht School of Management, I was able to extract through statistical analysis the factors of particular relevance for the success of NEH’s partnerships. 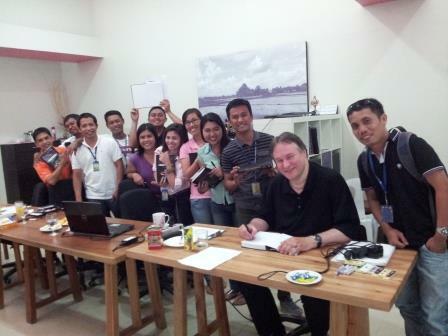 Armed with this knowledge I travelled to the Philippines to conduct a series of workshops with NEH and its partners. 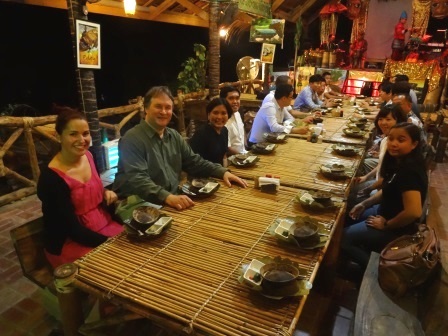 By that time, the Dutch Ministry of Foreign Affairs had issued a travel warning for visiting the southern Philippines because of political unrest. I can however testify that eating muesli for breakfast while travelling on a plane appears to be almost as risky; I had to go to the dentist first thing in the morning before any of the workshops could start. After this unexpected intermezzo it was time to get down to business. First I conducted a workshop with the HPO Coaches of NEH, the ones who help and guide NEH’s managers and staff during HPO transition activities, followed by an HPP workshop with staff involved in the partnerships of NEH, and finally a workshop with NEH’s managers to discuss the characteristics of the high performance manager (HPM). These workshop had basically the same set-up. I began with a short presentation on my newest research in the field of high performance followed by NEH’s staff applying this newly acquired knowledge to their own work situation. Subsequently, the ideas developed during the break-out sessions were presented and discussed in a plenary session. The results were later on used as input for NEH’s development programmes and improvement plans. And after each workshop, the attendees lined up for the book signing of my latest book ‘What Makes a high performance organisations’. 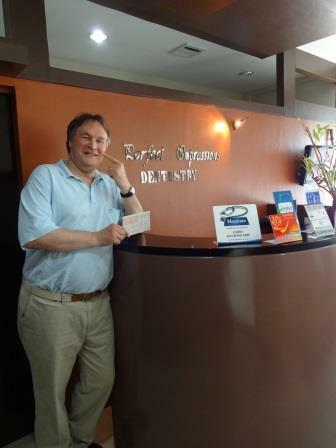 Contrary to my previous trip in 2012, there was fortunately some room to relax this time. 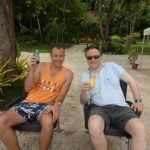 Jeroen de Haas, managing director of NEH, and his sister Marike were so kind to take me to a beautiful, recently opened beach resort called Tiki Beach on Sunday. 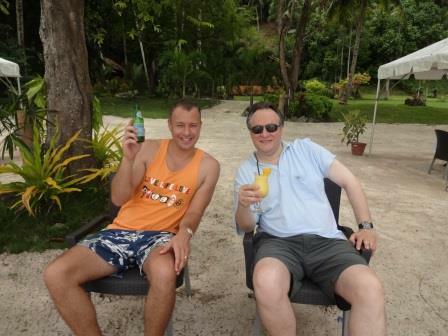 There we did some serious drinking (fruit punch, of course). 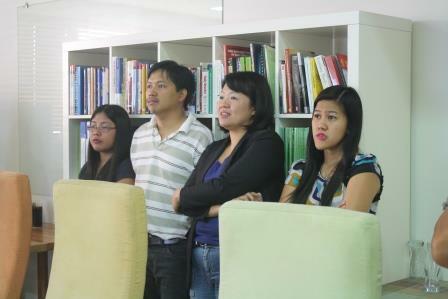 Monday morning it was back to work: the sessions with NEH’s value chain partners. 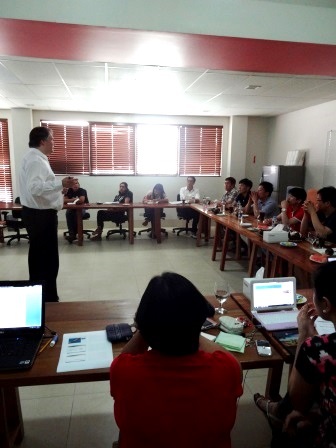 First was the workshop with an important Korean customer, Asia Marketing Corporation (AMC). 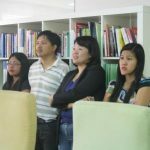 During this workshop the HPP Framework specifically developed for NEH’s partnerships was presented and the scores given by AMC to NEH, and vice versa, were amicably discussed. This was followed by a discussion on the improvements deemed necessary from AMC’s side and from NEH’s side in order to create a long-term world-class partnership. 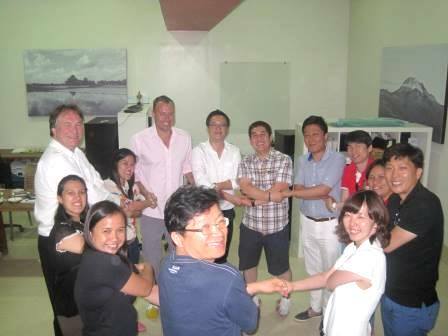 During this discussion, one of the participants came up with the idea of visualizing the HPP by holding hands in a crosswise fashion. 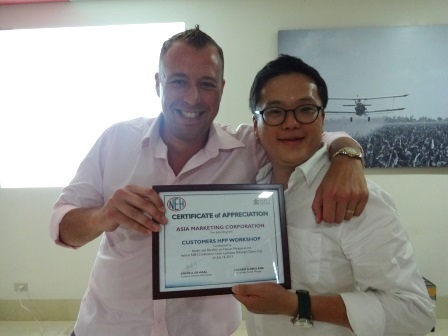 Afterwards Jeroen took Mr. Nick Lee, Imports Manager AMC, by surprise by handing him a certificate of appreciation. 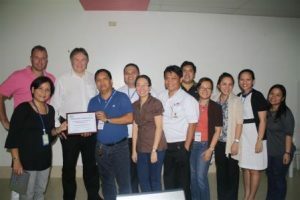 It was also suggested to give this workshop a follow-on by conducting an HPP Diagnosis at AMC and its partners. 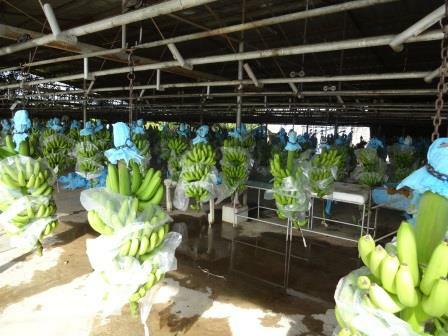 This could be an excellent opportunity to cover the entire banana value chain, from grower to supermarket, in the HPP! 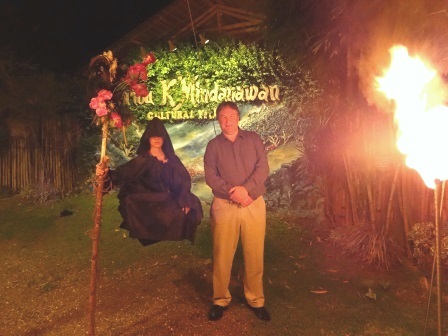 In the evening we were treated to a dinner and show at the Crocodile Park, just outside of Davao. A fitting ending to a very successful day. Although I do not drink any alcohol, I saw some strange things happening that evening! The next day it was back to work again, and another workshop, this time in the countryside. This was something I had been looking forward to for a very long time as we were going to visit one of NEH’s banana farms. We were shown around by one of the farmers, a former employee of NEH who had started his own banana plot with a loan of NEH several years ago. He was rightfully proud of his achievements as the yield of his hectarage was quite high. 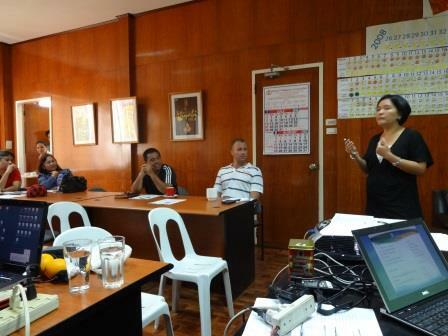 … and maybe not even a workshop conductor, as Charice, NEH’s project manager for HPO, took the lead in the subsequent workshop for the growers! 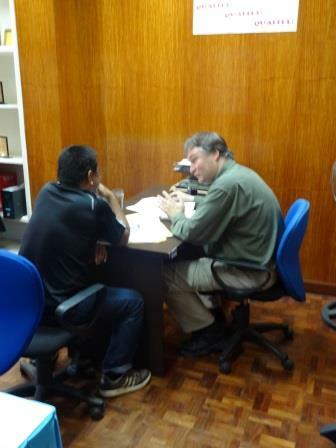 Fortunately I was still allowed to have discussions with one of the growers, Manuel Rotersos, about the HPP scores given by NEH to Rotersos and vice versa, and the consequences of these scores for the partnership (please note the sign on the wall). 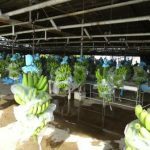 It goes without saying that possible improvements were discussed extensively, and it was decided to conduct these workshops in future with all participating growers! 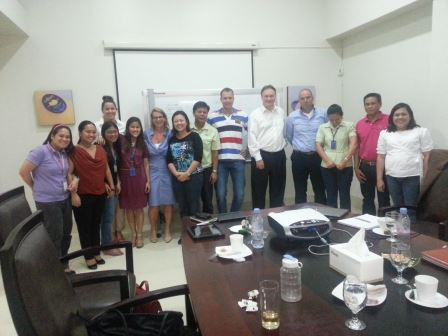 On the last day of the trip the final workshop was planned, with two of NEH’s suppliers: Cortess Printing and MINCORR. The set-up of this workshop was basically the same as the previous ones with growers and customers: a short presentation on HPP followed by discussions on improvements and a plenary get together. This time we went to lunch in one of the best Chinese restaurants of Davao, to unwind and to chat in an informal setting. This workshop was also a success as many improvements were identified and agreements were made to put these in practice as soon as possible. 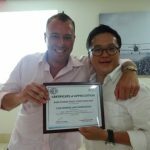 To ‘seal the deal’ another certificate was handed out by Jeroen to both suppliers. But the best certificate, in my view, was kept to the very end and I was the lucky one to receive it: I was “Diamond Banana” stickered! All in all, the entire trip was a marvelous experience and a great incentive to visit NEH again in 2014, to evaluate the progress on both the HPO transition and the HPPs. To be continued!